B2B.TheTradePost.com - Electric tricycle rickshaw for passenger, Product by Henan Fengshou New Energy Vehicle Co., Ltd.
We are a proffesional factory of electric tricycle rickshaw for passengers. Our passenger electric tricycle, passenger rickshaw can be used for taxi or carrying people. Our electric tricycle rickshaw for passenger is driven by large capacity electric battery. The electric tricycle can cut down your costs of traffic, transportation and logistics, It can save energy and protect the environment. The cost of using electric tricycle is 10% of petrol vehicles, so it can save a lot of money for your business. 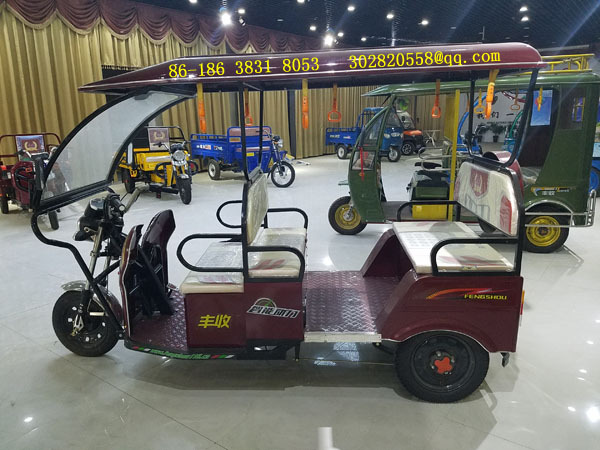 The passenger electric rickshaw tricycle has many advantages of strong applicability, flexibility, simple maintenance, convenient maintenance, low price and so on. It can go through the narrow streets flexibly. The electric tricycle has a reversing switch, which can realize the function of reversing and running conveniently. This is very practical in narrow alleyways and lanes, and is convenient for both parking and driving. As a result, electric tricycles have been used widely in family, urban and rural areas, factory area and mining area, such as short distance transportation and loading, short distance transporting passenger or taxi, sanitation, community cleaning and other short distance transportation.